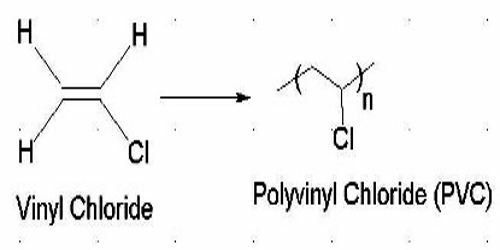 Polyvinyl chloride is a synthetic resin, composed of repeating units of vinyl chloride (C2H3Cl). Polyvinyl chloride is very versatile and is used in a wide variety of products, including rainwear, garden hoses, audio discs, and floor tiles. It is also known as poly vinyl or vinyl, commonly abbreviated PVC, is the world’s third-most widely produced synthetic plastic polymer, after polyethylene and polypropylene. 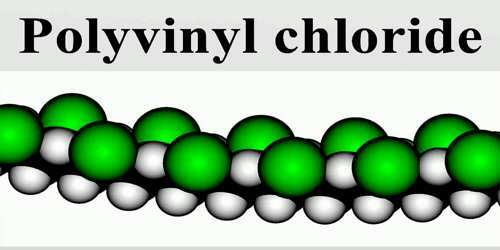 Vinyl chloride (CH2=CHCl), also known as chloroethylene, is most often obtained by reacting ethylene with oxygen and hydrogen chloride over a copper catalyst. It is a toxic and carcinogenic gas that is handled under special protective procedures. Polyvinyl chloride is also used for bottles, other non-food packaging, and cards (such as bank or membership cards). It can be made softer and more flexible by the addition of plasticizers, the most widely used being phthalates. 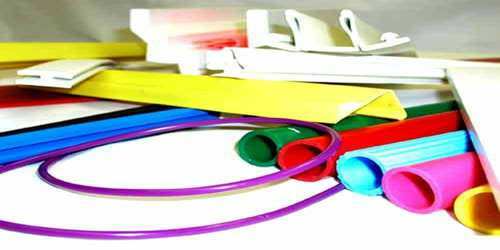 In this form, it is also used in plumbing, electrical cable insulation, imitation leather, signage, phonograph records, inflatable products, and many applications where it replaces rubber. Polyvinyl Chloride (PVC) is a thermoplastic made of 57% chlorine (derived from industrial grade salt) and 43% carbon (derived predominantly from oil / gas via ethylene). It is less dependent than other polymers on crude oil or natural gas, which are nonrenewable, and hence can be regarded as a natural resource saving plastic, in contrast to plastics such as PE, PP, PET and PS, which are totally dependent on oil or gas. This chlorine gives to PVC excellent fire resistance. PVC was accidentally synthesized in 1872 by German chemist Eugen Baumann. The polymer appeared as a white solid inside a flask of vinyl chloride that had been left exposed to sunlight. In the early 20th century the Russian chemist Ivan Ostromislensky and Fritz Klatte of the German chemical company Griesheim-Elektron both attempted to use PVC in commercial products. Pure PVC finds application in the construction trades, where its rigidity, strength, and flame resistance are useful in pipes, conduits, siding, window frames, and door frames. It is also blow-molded into clear, transparent bottles. Because of its rigidity, it must be extruded or molded above 100 °C (212 °F)—a temperature high enough to initiate chemical decomposition (in particular, the emission of hydrogen chloride [HCl]). Decomposition can be reduced by the addition of stabilizers, which are mainly compounds of metals such as cadmium, zinc, tin, or lead. PVC is predominant in the construction industry due to its low production cost, ease to mold and lightweight. It is used as a replacement for metal in many applications where corrosion can compromise functionality and escalate maintenance costs. 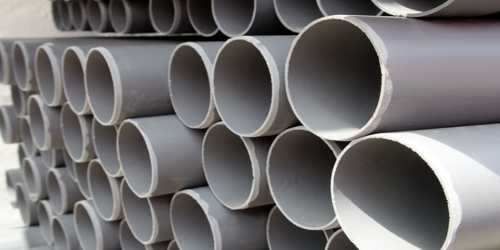 Many of the world’s pipes are made from PVC and these are used in industrial and municipal applications. It is also used to make pipe fitting and pipe conduits. In the health care industry, it is used to make feeding tubes, blood bags, intravenous (IV) bags, parts of dialysis devices and many other items. This is only possible when phthalates are added to it. Phthalates are used as plasticizers to produce flexible grades of PVC (and other plastics), thus making it better suited for the aforementioned applications due to improved performance characteristics. Common consumer products such as raincoats, plastic bags, toys, credit cards, hoses, doors and window frames and shower curtains are also made from PVC. This is not an exhaustive list of the many products that can be found around the household with PVC as its main constituent.